​We offer NERF Parties - the kids will go into teams and can use our equipment, mats, and boxes to hide! Bring your own blasters or rent ours! 2 Hours of Fun! 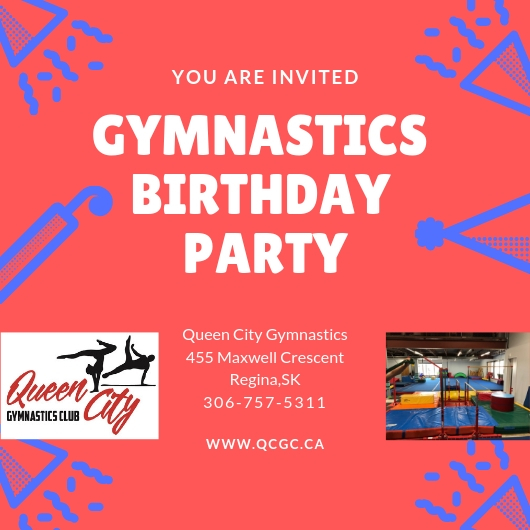 You will have the entire recreational gym for an hour and fifteen minutes of fun with a coach, followed by 45 minutes in our party room to have cake and open gifts! Click on the attachment below to download a birthday invitation poster you can include in emails to your friends! QCG is happy to provide services to daycares, schools and community groups who would like a little exercise and fun. Bookings can be made for one-time or weekly outings. One adult helper must be made available for every 10 children for all groups except elementary and high schools, where a physical education teacher must be present. *Email office@qcgc.ca or call (306) 757-5311 to book your event. $7.50 per child for one hour of gym time with a certified coach. Minimum $75.00 per booking. Book 10 sessions or more and receive a discount! Want to do something different instead of the same old thing every year? Try Gymnastics! We have bookings available for Christmas Parties, Graduations, Year End, and Wind Ups. Each booking consists of one or two hours on the floor with a certified coach teaching the fundamentals of gymnastics, such as artistic and trampoline events. Option 1: $75.00 for 1 hour (up to 10 people). Option 2: $150.00 for 2 hours (up to 10 people). $7.50 per each additional child per hour. *Booking times vary according to space and availability of coaches. Payment must be made to QCG prior to gym time. Contact office@qcgc.ca or call (306) 757-5311.